There’s no doubt that kids love holidays. It doesn’t matter what holiday it is, as long as it involves eating candy and celebrating at school, they’re happy. 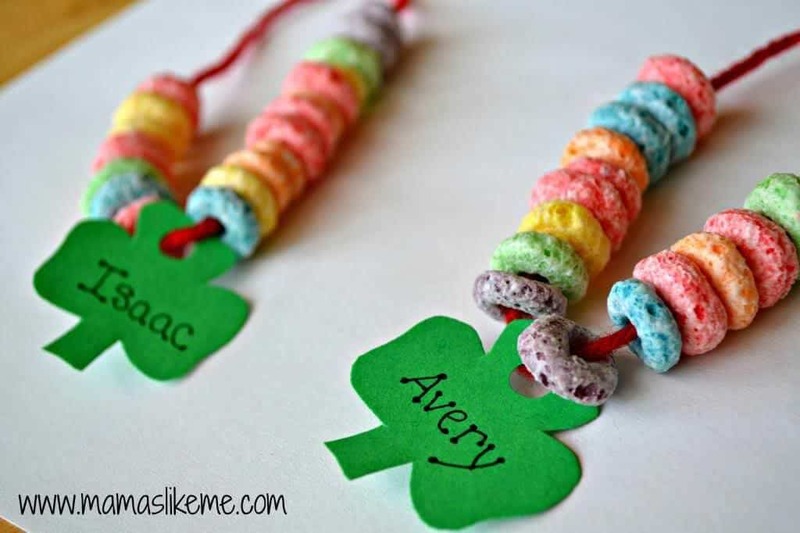 St. Patrick’s day is coming up soon and I’m sure your kiddos are starting to get excited. They may already be asking to decorate for the holiday or to make some festive crafts. 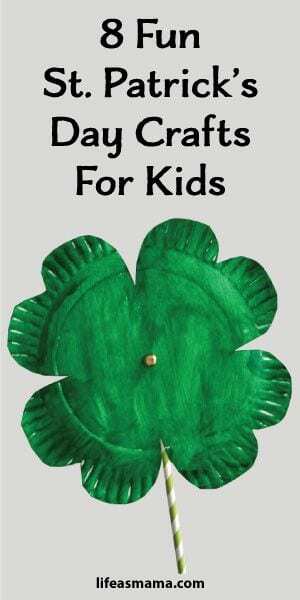 There’s lots of fun, easy St. Patrick’s Day crafts for kids that they can do while they’re home after school or on the weekends not only to get them excited about the upcoming holiday, but to keep them entertained, as well. Here are a few of the cutest ones we’ve found. Paper plates are seriously so versatile, especially when it comes to using them for crafts! 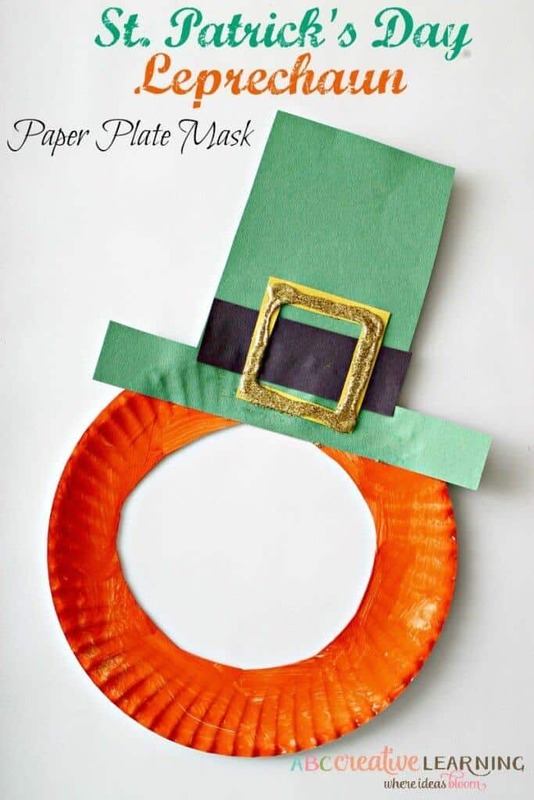 Can you imagine how much fun your kiddo will have making this mask, and then wearing it around the house acting like they are a leprechaun? It’ll provide hours of entertainment and lots of fun imaginative play. (Check out ABC Creative Learning for parenting tips, homeschooling ideas, travel ideas, fun food recipes, and more). What kid doesn’t love rainbows? 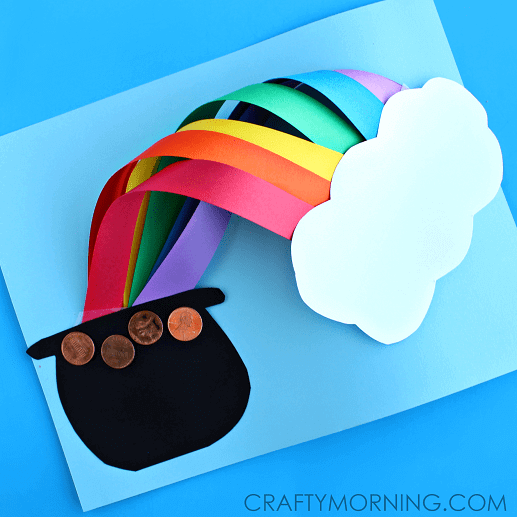 All the colors just look so pretty together and they can’t get enough of them, which means they’ll love making this 3D rainbow craft. All you need is some paper, glue and some pennies and you’re good to go. Whether or not your kids actually leave the pennies on the paper is another story, but at least they’ll have fun making this. (Crafty Morning is a website dedicated to all things crafting from kids crafts, to adult crafts, to holiday crafts, and more). 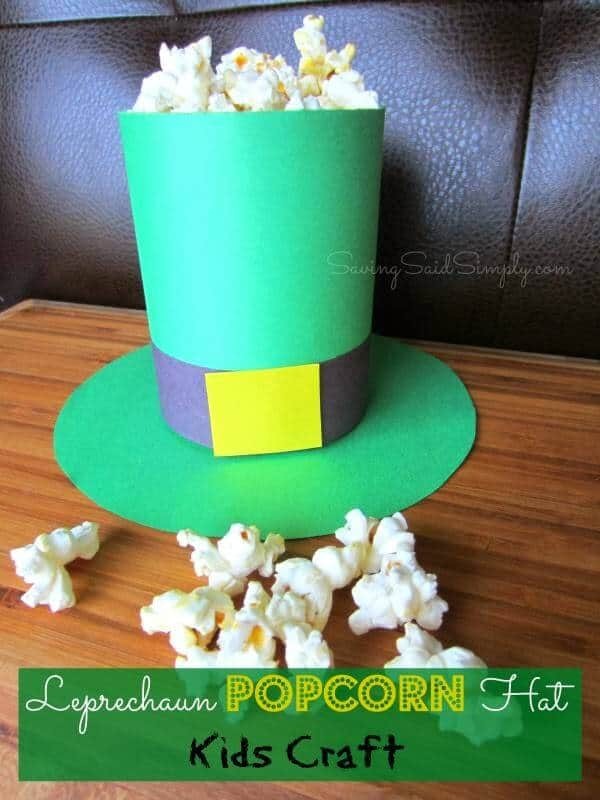 If you’re going to have a movie night anytime soon before St. Patrick’s Day you’ve got to have your child make this popcorn hat. You can turn it into a whole night of fun: make the popcorn hats, pop some popcorn, then watch a movie of their choice. Can you imagine how excited they’ll be to eat out of this cute hat? They’ll eat it up…literally! (Raising Whasians is another website full of delicious recipes, crafts, travel tips, fashion advice, and so much more). What child doesn’t love a little edible jewelry? I used to love candy necklaces and bracelets as a kid. Although this necklace isn’t candy, it’s close enough! Fruit Loops are always a favorite for kids. 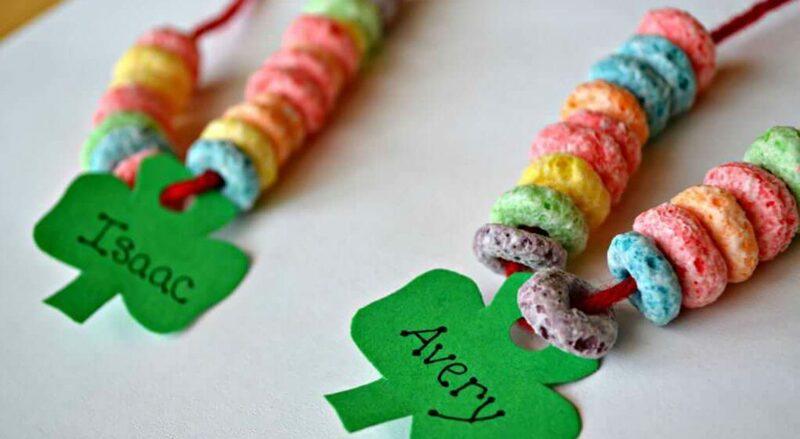 They can thread the pieces of cereal on the necklace themselves and then enjoy the necklace all day long as they play. (Check out Mamas Like Me for more parenting advice, yummy recipes, kid crafts, and lots more). Wind catchers are always fun to watch, and even more fun to make because not only do you get to make it your own, but every time you look at it you have a sense of pride and excitement that you created that yourself. Imagine how your kids will feel seeing this swaying in the wind in the backyard after they’ve completed it? What’s even better is that it’s easy to make and your kids get to use paint! What kid doesn’t love crafting with paint? 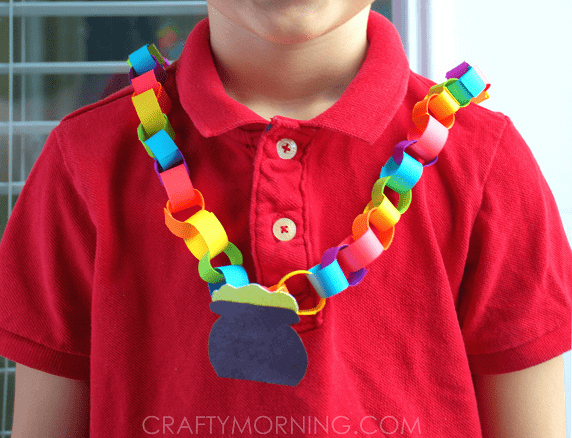 For a different rainbow necklace this St. Patrick’s day let your kids make this cute chain necklace out of construction paper. I used to love making these when I was a kid and I’m sure your kids will love it too. You don’t even have to make it a necklace if you don’t want. They can simply make it a countdown to the holiday. The key is just to have fun and enjoy the craft. 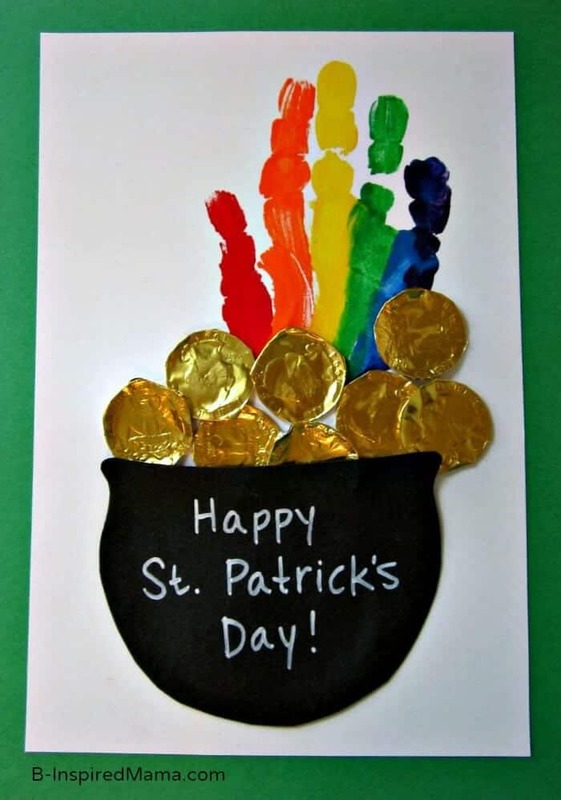 This may be the best kid craft yet for St. Patrick’s day because the kids actually get to eat the gold coins! Once you tell your kid that they get to eat chocolate while making something, they’ll jump at the opportunity. Heck, I want to make one too so I can eat that chocolate! (B-Inspired Mama is a great website for moms that are looking for kid crafts, fun learning activities, family friendly recipes, and more). How fun is this shamrock twirler? Not only will your kids have fun painting this and cutting it out, but they’ll be able to play with it afterwards when the twist it and twirl it. There’s nothing better than making a craft that will provide entertainment after your kids are done making it. (Head over to I Heart Crafty Things for all different kinds of crafts, DIY projects, and fun recipes). 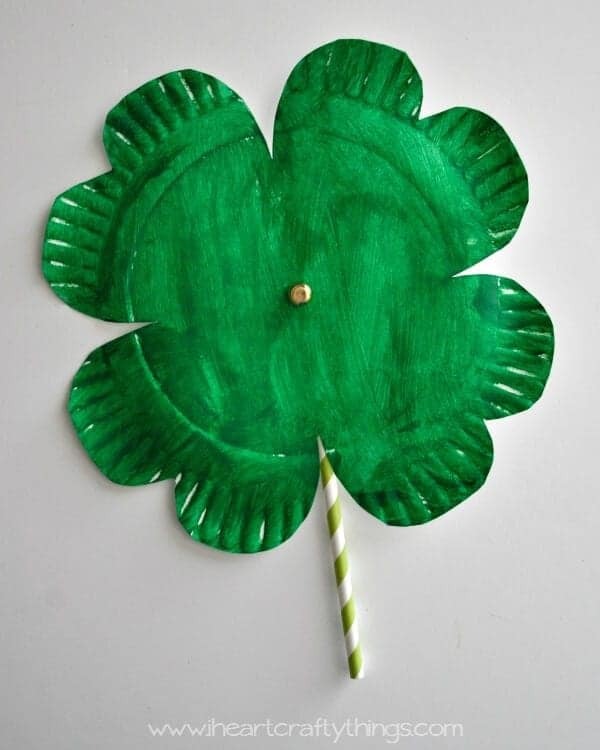 The post 8 Fun St. Patrick’s Day Crafts For Kids appeared first on Life As Mama.